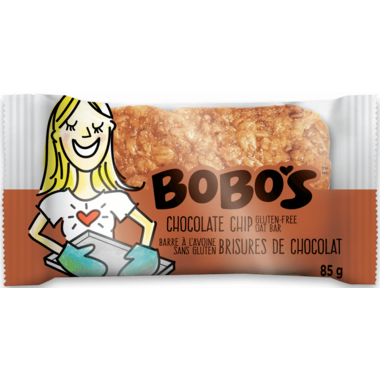 No offense to Chocolate Chip cookies, but Bobo's Chocolate Chip bar is kind of a big deal. This tasty treat feels more like dessert than breakfast, but without the guilt. The slow-burning oats leave you feeling satiated beyond measure, satisfying your hunger and your sweet tooth. This bar is recommended at all times, 24-hours-a-day. Ingredients: Organic rolled oats, brown rice syrup, buttery spread [oil blend (palm fruit, canola, olive oil), water, salt, natural flavor, sunflower lecithin, lactic acid, annatto (color)], organic cane sugar, semi-sweet chocolate chips (oraganic cane sugar, unsweetened chocolate, cocoa butter), vanilla extract (water, alcohol, sugar, vanilla bean extractives), xanthan gum, salt. May contain traces of pecans, coconut, almond, peanuts. I received a sample of this oat bar and loved it! Moist chewy oats and nice added touch with the mini chocolate chips so I splurged and ordered a few bars. Unfortunately two of the four bars were stale, with an expiration date two months away. And you canâ€™t mistake stale oats... hard, dry. Disappointing. Iâ€™m guessing I got a bad batch but all that means is poor quality control. Will not be buying them again. Love this oatmeal bar. Always looking for a moist oatmeal type of cookie whether with chocolate chips or raisins, Bobo's does the trick to replace a cookie.